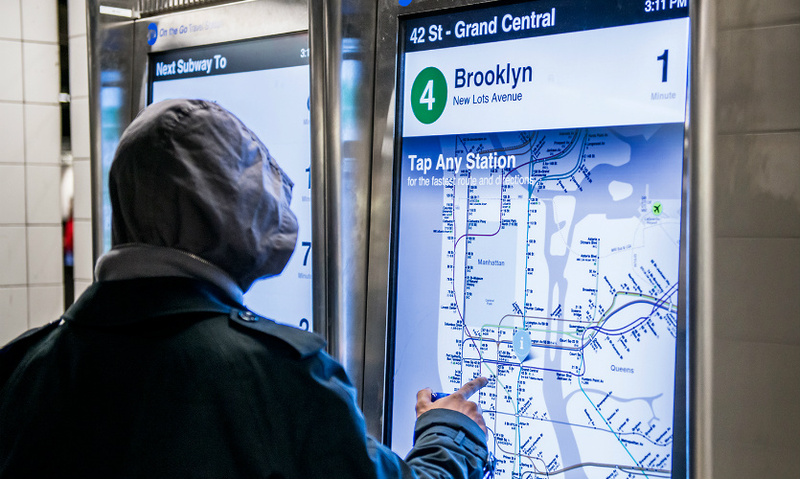 In New York City, 90 new touchscreen subway station kiosks allow riders to access information specific to their routes, including transfers and delays. 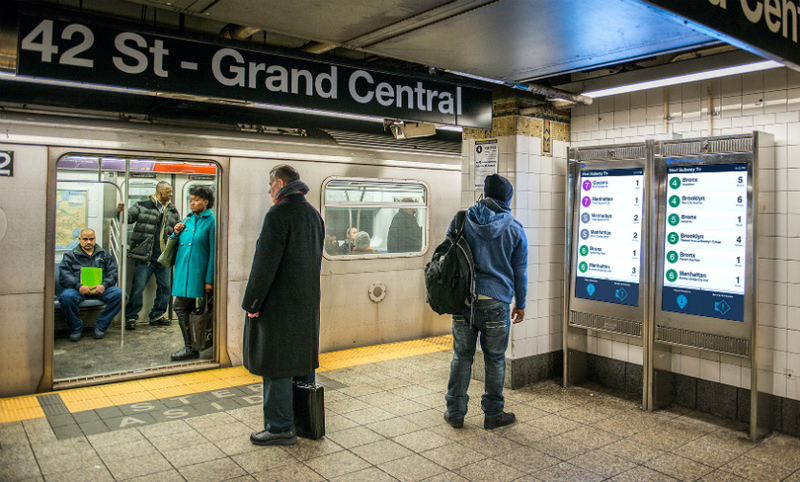 The MTA wanted to create digital touchpoints to provide its riders with better information. At Kate Spade’s Saturday store in Tokyo, iPads deliver images, videos, and product stories to shoppers, encouraging them to stay longer and connect with the brand. 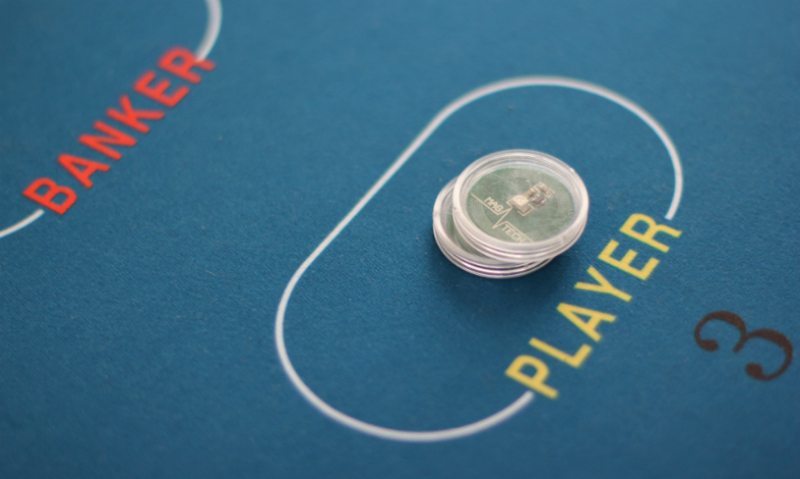 Control Group’s digital baccarat table for Walker Digital Table Systems retains the traditional felt table surface and hard plastic chips, but uses embedded RFID and sensor technologies to personalize the game for each user and prevent cheating. At four airports including JFK and LaGuardia, Airport Concierge allows travelers to relax while airport offerings are delivered to them. 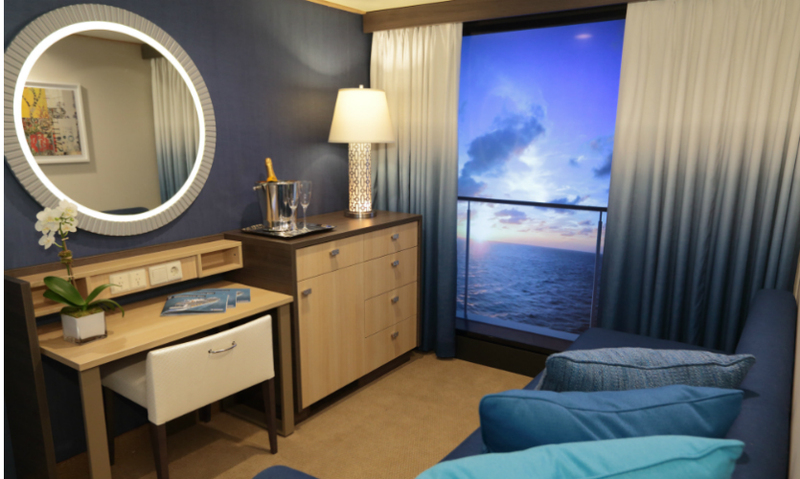 On Royal Caribbean’s Quantum of the Seas cruise ship, even travelers with interior cabins get a balcony view. Control Group used cinematic cameras on the ship’s stem and stern to deliver real-time views to the cabins via digital windows. What is your background, Paul? I’ve spent more than a decade leading the strategic, user experience, and technical development aspects of a range of platforms, products, and services. I’m also passionate about community development, urban planning, and socially responsible design efforts. 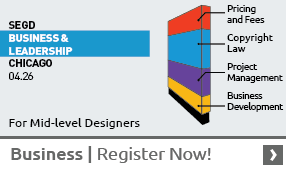 My involvement at Pratt Institute, both as a student and associate professor, has focused on strategic design and product design within the Design Management Graduate Program. What does Control Group do? We’re a design and technology consultancy of about 125 people focused on customer experience and innovation. We’ve found a niche in being able to understand both business and user challenges, concept and prototype solutions, and apply our technical depth to making them feasible and scalable. We’ve been working with the New York City Metropolitan Transit Authority to create digital touchpoints that provide better information to subway riders. The MTA wants to communicate better with its commuters, but it doesn’t want to raise fares in doing so. So our system is based on an advertising revenue model that will help fund ongoing product development. The new HD displays provide real-time information including simple one-touch visual station directions with transfers and line alerts, countdown to train arrival, relevant service updates, and an interactive content loop for advertising. We have close to 100 deployed underground and are currently learning from rider usage about the best ways to improve the experience. Exciting things are also happening in the retail space. Last year, we completed an in-store experience for a new Kate Spade flagship launch in Tokyo that uses iPads throughout the store to deliver high-quality content such as images, videos, social network product sharing, and product specs. It all encourages shoppers to stay and interact with the products longer and is more dynamic than traditional paper signage. Knowing that its customers dislike wasting time in airport terminals, OTG Management asked us to develop an experience that would bring airport offerings to their fingertips. 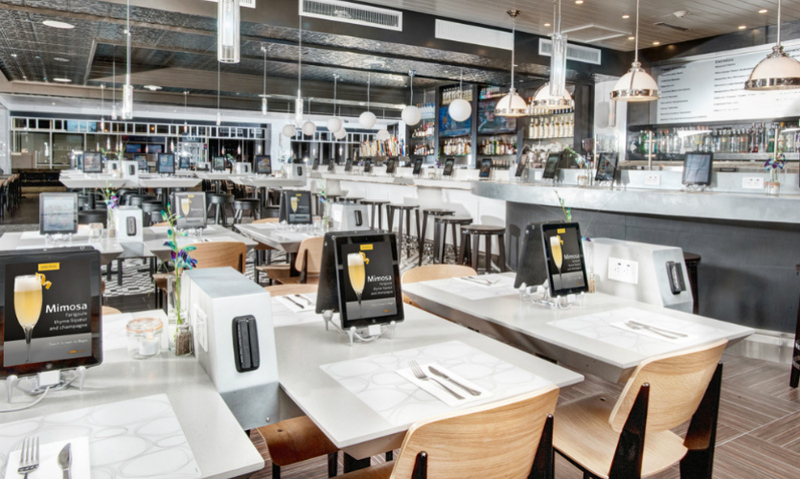 Using iPads, the Airport Concierge platform allows users to relax while their meal or newspaper is delivered to them, even from multiple airport outlets. They can also check flight times, Facebook, and email. That program is in place at JFK, LaGuardia, Toronto, and Minneapolis-St. Paul. Your Xlab presentation is focused on “Non-conscious Interfaces.” What do you mean by that term? The idea of the interface is evolving all the time, and we’re very interested in an approach that responds to natural human behavior rather than forcing artificial interaction with machines. Part of that arc is how the Internet of Things is enabling more passive interactions—or exchanges, as I like to call them—using beacon, RFID, or other technologies. The EasyPass highway toll system is a simple example of using embedded technologies to provide utility and convenience to users (passing through the toll gate without stopping), as well as benefits to the operator (less traffic congestion, traffic data, and guaranteed revenue). It’s the idea of an experience going on in the background without a direct customer interface or touch to a control. There is an initial exchange of information about you as you enter the space and that information might inform other parts of the experience. We’re working on some great projects right now in this space. You’ll hear more about those projects at Xlab! I guess some people would say there are downsides to these embedded technologies? The balance, of course, is implementing these types of interfaces in a world of password security breaches (Home Depot and iCloud just recently) and concern about privacy and intellectual property. The question is, how can you use these technologies to ethically learn more about people and how they act in spaces, and provide them with utility and relevant information? Agencies like yours are developing ever more sophisticated touchpoints in the built environment. How do you make sure these touchpoints are connected and in sync? What happens if they’re not? Great question. It’s really a branding problem. If your brand is trying to communicate a certain set of values, every single exchange should be aligned with that mission, from the customer service call on the telephone to the kiosk you may use in the mall. If it’s not, it can potentially put your customers off. It gets jarring is when a client or agency wants to throw in the latest whiz-bang thing that’s shiny and what they might think of as “new”. If this effort is out of sequence with other communications efforts, it’s very noticeable. We see a lot of these technology investments end up in tech graveyards gathering dust.